There are currently no digitized images of this exhibition. If images are needed, contact archives.research@brooklynmuseum.org. 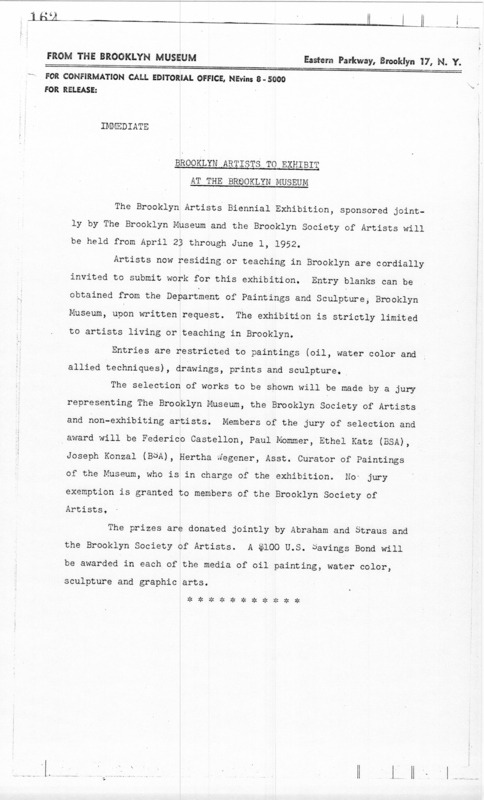 April 23, 1952 The Brooklyn Artists Biennial Exhibition, sponsored jointly by The Brooklyn Museum and the Brooklyn Society of Artists will be held from April 23 through June 1, 1952. Artists now residing or teaching in Brooklyn are cordially invited to submit work for this exhibition. Entry blanks can be obtained from the Department of Paintings and Sculpture, Brooklyn Museum, upon written request. The exhibition is strictly limited to artists living or teaching in Brooklyn. Entries are restricted to paintings (oil, water color and allied techniques), drawings, prints and sculpture. The selection of works to be shown will be made by a jury representing The Brooklyn Museum, the Brooklyn Society of Artists and non-exhibiting artists. Members of the jury of selection and award will be Federico Castellon, Paul Mommer, Ethel Katz (BSA), Joseph Konzal (BSA), Hertha Wegener, Asst. Curator of Paintings of the Museum, who is in charge of the exhibition. No jury exemption is granted to members of the Brooklyn Society of Artists. The prizes are donated jointly by Abraham and Straus and the Brooklyn Society of Artists. A $100 U.S. Savings Bond will be awarded in each of the media of oil painting, water color, sculpture and graphic arts. Brooklyn Museum Archives. Records of the Department of Public Information. Press releases, 1947 - 1952. 04-06/1952, 035. 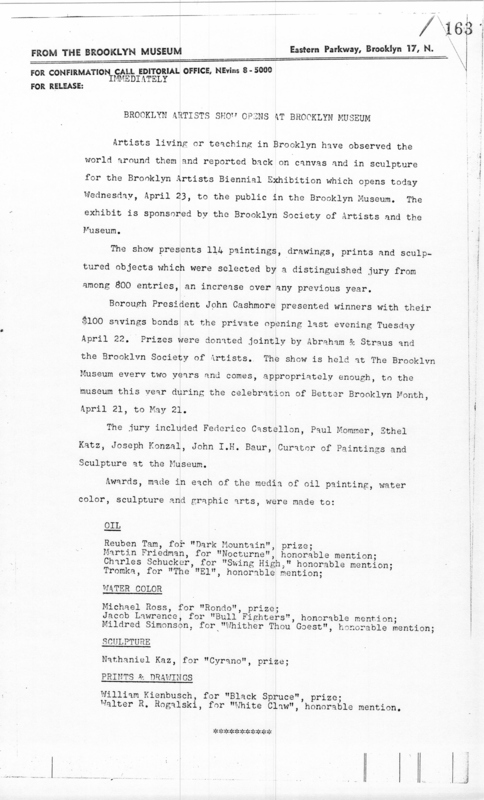 April 23, 1952 Artists living or teaching in Brooklyn have observed the world around them and reported back on canvas and in sculpture for the Brooklyn Artists Biennial Exhibition which opens today Wednesday, April 23, to the public in the Brooklyn Museum. The exhibit is sponsored by the Brooklyn Society of Artists and the Museum. The show presents 114 paintings, drawings, prints and sculptured objects which were selected by a distinguished jury from among 800 entries, an increase over any previous year. Borough President John Cashmore presented winners with their $100 savings bonds at the private opening last evening Tuesday April 22. Prizes were donated jointly by Abraham & Straus and the Brooklyn Society of Artists. The show is held at The Brooklyn Museum every two years and comes, appropriately enough, to the museum this year during the celebration of Better Brooklyn Month, April 21, to May 21. The jury included Federico Castellon, Paul Mommer, Ethel Katz, Joseph Konzal, John I.H. Baur, Curator of Paintings and Sculpture at the Museum. Walter R. Rogalski, for “White Claw", honorable mention. Brooklyn Museum Archives. Records of the Department of Public Information. Press releases, 1947 - 1952. 04-06/1952, 036.